We develop a dynamical systems approach to prioritizing multiple tasks in the context of a mobile robot. We take navigation as our prototypical task, and use vector field planners derived from navigation functions to encode control policies that achieve each individual task. We associate a scalar quantity with each task, representing its current importance to the robot; this value evolves in time as the robot achieves tasks. In our framework, the robot uses as its control input a convex combination of the individual task vector fields. The weights of the convex combination evolve dynamically according to a decision model adapted from the bio-inspired literature on swarm decision making, using the task values as an input. 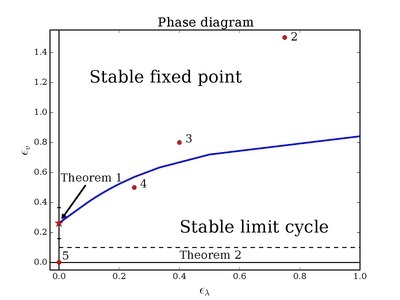 We study a simple case with two navigation tasks and derive conditions under which a stable limit cycle can be proven to emerge. While owing along the limit cycle, the robot periodically navigates to each of the two goal locations; moreover, numerical study suggests that the basin of attraction is quite large so that significant perturbations are recovered with a reliable return to the desired task coordination pattern.